How can we, as science educators, support and guide students' thinking in order to improve their scientific and technical writing? There are all different types of writing and writing styles. Science, like other disciplines, tends to have a particular way of writing unique the field. We need to instruct students in how to write like scientists. Summary writing - what happened? Analysis writing - why/how did it happen? Summary and Process writing align with Common Core Writing Standard 2. 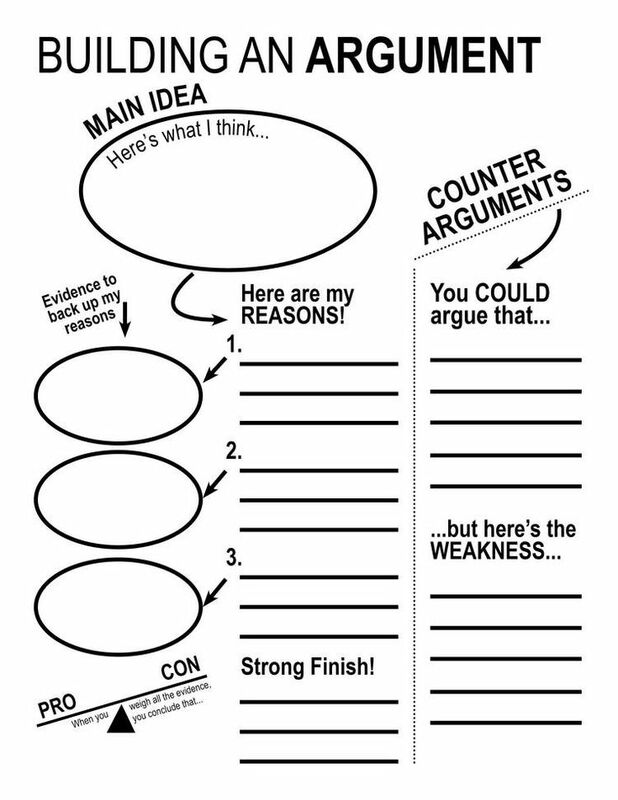 Analysis writing aligns with Argumentative writing, Writing 1. Shouldn't she be wearing safety glasses if she plans on swinging around flasks like that? Our students know how to write! Our students are literate individuals who can string together words and phrases to communicate meaning. It is our job to help them refine that. We need to assist them in their thinking about science so they can write about science. Thinking and writing are both challenging processes. Treating them separately allows for better quality of both. Graphic organizers do not have to be elaborate or fancy. 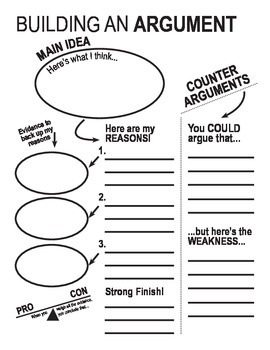 These are two of the many pre-made graphic organizers found online. They can be easily adapted for our purposes. They can also be made into a Google Document that can be done online if that's something desired. Click on the picture to be taken to the image. Sentence frames help students think about the science words without worrying too much about the sentence structure. Initially. Later we change that. The purpose of the lab was to ___________ by ___________. Sure they need a little work. However, this is a fantastic jumping off point. The purpose of the lab was to determine the effect of concentration on the rate of a chemical reaction by changing the concentration of hydrochloric acid, then calculating the rate. The purpose of the lab was to determine the effect of concentration on the rate of a chemical reaction by changing the concentration of the same volume in the desired solution. The purpose of the lab was to assess the rate of the reaction of Mg when put in HCl and water by mixing a certain amount of HCl in water and placing a 5cm about .054g to a .067g sample of Mg to the solution. The purpose of the lab was to determine the effect of the concentration of HCl on the reaction between Magnesium and HCl by comparing the reaction rates on the same amount of Magnesium but differing concentrations of HCl. First Step: Separate experimental analysis from writing! Students should process information first and then write about that information. One way to achieve this is to keep asking our questions. The questions that we ask at the end of our labs or are at the end of "cookbook" labs can be good because they help our students process what they did. They need to process before they write. 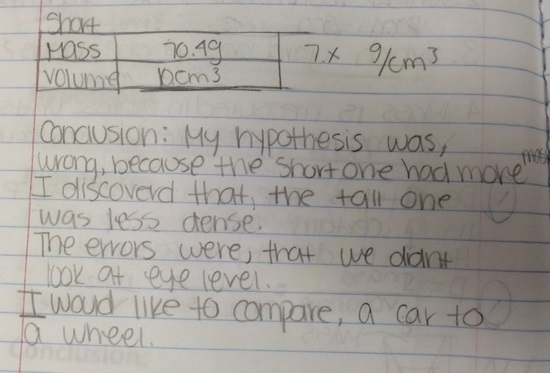 What if take labs we already do with our students and just play with having them write conclusions? Or writing introductions? Graphic organizers are useful in this step. Graphic organizers can be a simple table that you build or more complex. You may need to give them guidance for some of the frames. Notice that some of the frames to the right have additional information to help students complete the sentence. It is important to model! Do these with students. You do one for a different scenario in front of them. Talk your thinking process out loud so they know how you are thinking. The purpose of the lab was to ___________ by _________. The chemical reaction studied was _______. To achieve this we conducted five different experiments as class on __________. My team, Team _______, tested the effect of ____________ on _________. The independent variable Team _________ tested was __________ and the dependent variable was ____________. Variables that we used as control variables across all five experiments were __________. Repeat steps for each claim. Note that it is entirely appropriate that each claim may warrant its own paragraph. One error that we made in the lab was _________. (If there were no known errors then you can also state a challenge/difficulty or skip this if there were none). A way to prevent this error in the future is ___________. (Alternatively: A way to address this challenge/difficulty is ___________). 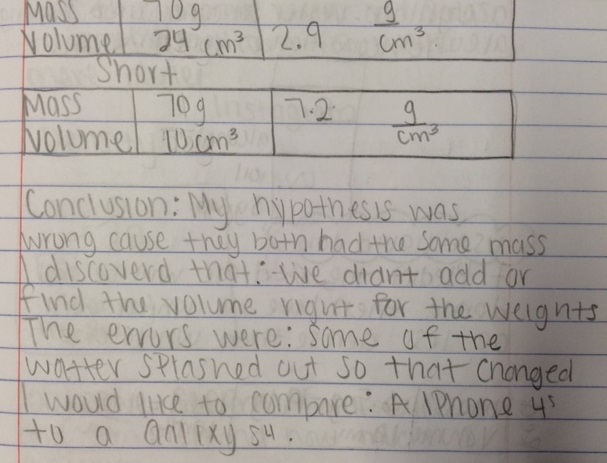 If you had more than one error, then address that next and so on until you talk about all of the lab errors you made. Overall, the experiment can be considered a __________ because ____________. (This is where say whether you were a success, failure, or inconclusive because you were able/not able/not sure if able to achieve the purpose of the experiment). This is the place where it is appropriate for scientists to include conjecture, personal opinions, commentary, etc. Research shows that students grow the most with meaningful, personal feedback. It has been my experience that by scaffolding things this way I receive better written results. This makes it faster and much more pleasant for me to grade. On option is to use an "I do, We do, You do" Model to accomplish the gradual release of teacher responsibility. First, provide them all of the scaffolding. Go through this process with them multiple times as appropriate. Emphasize that you are training them in science writing and they are learning new ways to think. For the first time you might just do one piece: writing a hypothesis or writing a conclusion. The following time you add another piece. This process could be done over the span of the first quarter. Next, students need to start providing some of this structure on their own. 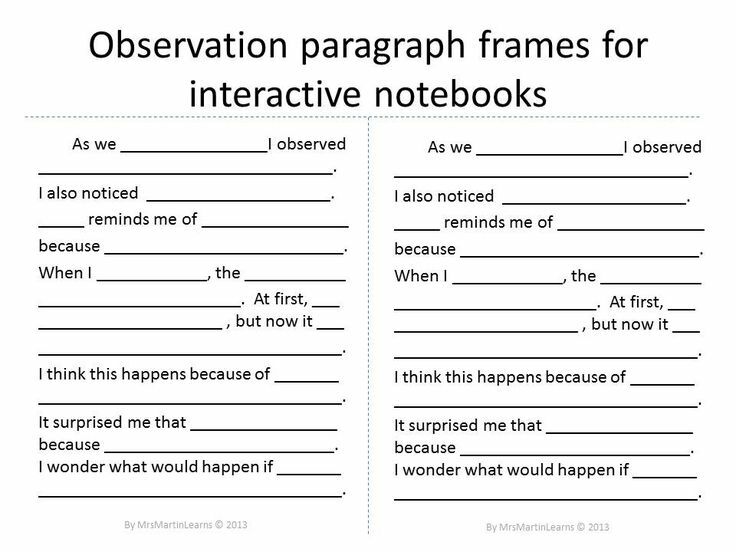 Instead of handing them a graphic organizer or the sentence frames, have students see what they can remember in terms of how it was organized before. Prompt them and show them your model again, emphasizing that they will need to internalize it over the course of the year. Repeat this process, each time getting students to provide more and more with each experiment over the term. Ultimately, students should be able to create the organizers and frames themselves. Again, this could be a quarter-long process with students. Now students should have a process down. They should be able to analyze their lab information and then write about it. Now the training wheels are off. Students have multiple samples of writing completed and other reference points for them to carry through this process with minimal assistance.